"We Will Be Where the Fish Are"
The days of fishing out of one port all year long are over. No more crazy long runs to the fish and no more scraping by when there is a known mass of fish in another part of the Maryland Chesapeake Bay. From the Upper Chesapeake (above the Bay Bridge) all the way down to the MD/VA line and just below we have the experience and willingness to move the boats as needed to be as close to possible to the best and most consistent fishing the Chesapeake Bay has to offer. 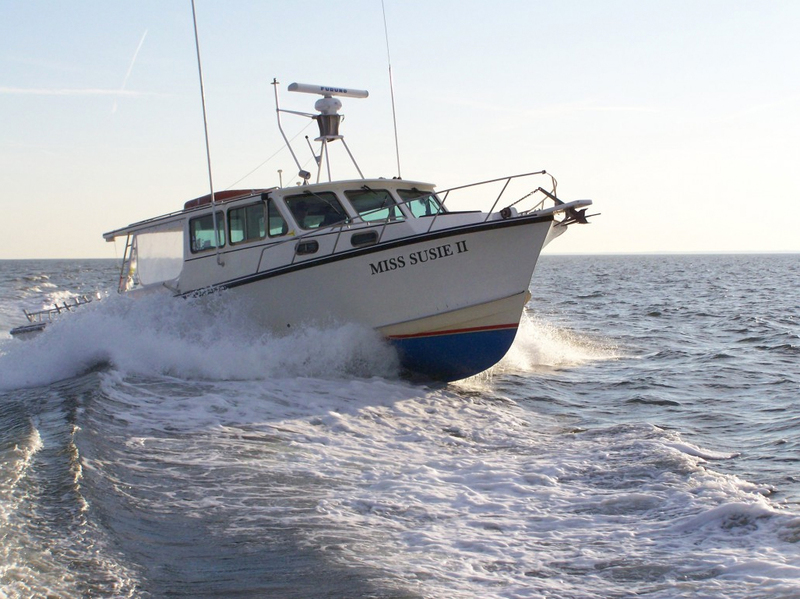 Mission Statement: Our main goal at Miss Susie Charters is to ensure that our clients have an enjoyable, fun-filled, and exciting experience each time they charter the Miss Susie II or Miss Susie III. 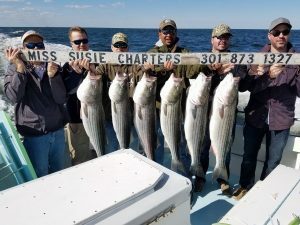 We ensure this by providing professional Chesapeake Bay fishing charters run by Captains who flat out love to fish and know how to treat clients. Captain Greg Buckner and Captain Steve Scrivener are honest, knowledgeable, friendly, entertaining, and respectful of their clients needs. They understand that some of their clients want a very energetic, fast-paced atmosphere while others just want to relax and enjoy their time on the water. Capt. Greg and Capt. Steve have no problem addressing all of their client’s questions during a charter and love explaining the different types and methods of fishing that are employed aboard Miss Susie II & III. While on board Miss Susie II with Capt. Greg or while on board Miss Susie III with Capt. Steve you can rest assured that no one will try harder to provide a successful day of fishing; they are always willing to go the few extra miles and use any method or means necessary to ensure a productive catch. The Chesapeake Bay is a truly special body of water where saltwater from the Atlantic Ocean blends with the many freshwater rivers and streams that feed this diverse estuary. This saltwater and freshwater mixture is home to a vast array of marine life including tiny minnows, crabs, oysters, and of course several species of gamefish. Because of this special blend of water, the Chesapeake Bay offers some of the best and most consistent fishing action found anywhere on the Atlantic Coast. The sought after gamefish species that populate the Chesapeake include Striped Bass (Rockfish), Bluefish, Spanish Mackerel, Flounder, Sea Trout, Croaker, and Spot. 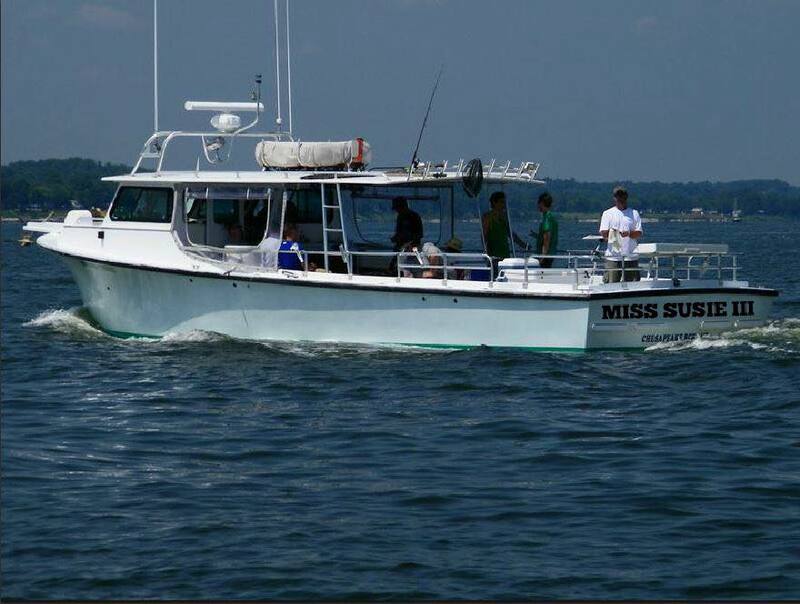 Because of the abundance of these species and our love for fishing, Miss Susie Charters offers fishing charters departing from Solomons Island, MD, Deale, MD, & Arnold, MD fishing the bountiful waters of the Chesapeake Bay. 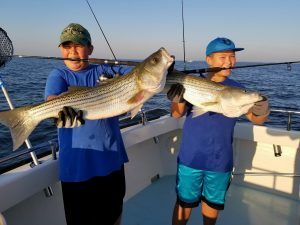 Mid June---Late August (Arnold, MD): Trolling using smaller lures for Rockfish 20 inches to about 38 inches and as soon as the Live Norfolk Spot become available we start light tackle live lining using them as bait. This time of the year also features the very best bottom Fishing for White Perch known to man. September 1---Mid October (Deale, MD): As summer stretches on the “Above the Bay Bridge” bites starts to become inconsistent and we head back to Deale, MD for a light tackle live lining bonanza on Rockfish 20 inches to about 26 inches in length. 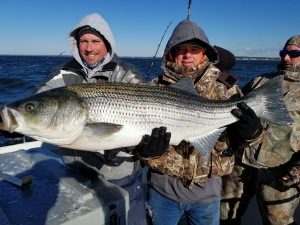 We don’t see many large Stripers this time of year but the consistency and action are there daily along with good bottom fishing for Norfolk Spot and White Perch. Some years Bluefish and Spanish Mackerel make impressive showings late summer into early Fall. Mid October---Mid November (Solomons, MD): Excellent light tackle live lining on Structure using Live Norfolk Spot to catch Rockfish 20 inches to about 40inches. Before the water cools off too much, there is often impressive bottom fishing for Spot & Perch. Mid November---December 31 (Ridge, MD): Trolling with a spread of 8 to 10 lines, often chasing schools of feeding Rockfish that have massive flocks of birds feeding above them picking up scraps. Late December we often troll with the full spread and occasionally manage to catch a Trophy Sized fish over 40 lbs mixed in with the rest of the 20 inch to 36 inch fish.